The 3M Scott Safety ProPak-F-EZ-FLO is a Type 2 open circuit, self-contained, compressed air breathing apparatus. The 3M Scott Safety ProPak-F-EZ-FLO is a Type 2 open circuit, self-contained, compressed air breathing apparatus. It consists of a back plate, padded carrying harness and pneumatic system, containing a cylinder connector, reducer, pressure gauge, whistle and demand valve. The ProPak-F-EZ-FLO can be configured in a number of different ways with various size single cylinders. There are also a range of variants available including Airline (AC), Split Demand Valve Coupling (SDC or Y2C), Quick Connect Option or Duo variants. The ProPak-F-EZ-FLO is used in conjunction with AV3000HT facemask and a choice of composite or steel cylinders. 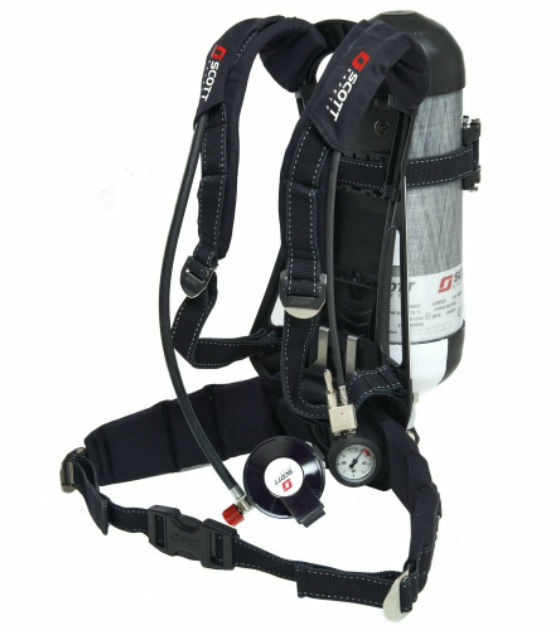 2031958 PROPAK-f-EZ-Flo (V2) Self contained breathing apparatus for single cylinder use, comprising lightweight rigid backplate with cylinder band and fully adjustable padded body harness. Two stage pneumatic system comprising EZ-Flo positive pressure demand valve with bypass: shoulder mounted pressure indicator and 55 bar warning whistle: first stage pressure reducer with single high pressure 200/300 bar cylinder connector. Harness fabricated from Kevlar and Pyrogard blend webbing and Proban material and apparatus features lumbar padding. Webbing contains reflective thread. Apparatus is CE Marked to EN137:2006 Type 2 Apparatus supplied less facemask, please order AV3000HT facemask seperately. 2031949 PROPAK-f-EZ-Flo- CBRN (V2) Self contained breathing apparatus for single cylinder use, comprising lightweight rigid backplate with cylinder band and fully adjustable padded body harness. Two stage pneumatic system comprising EZ-Flo positive pressure demand valve with bypass: shoulder mounted pressure indicator and 55 bar warning whistle: first stage pressure reducer with single high pressure 200/300 bar cylinder connector. Harness fabricated from Kevlar and Pyrogard blend webbing and Proban material and apparatus features lumbar padding. Webbing contains reflective thread. Apparatus is CE Marked to EN137:2006 Type 2 and BS8468-1 Apparatus supplied less facemask, please order AV3000HT facemask seperately.